Stop spinning your wheels and make your practice count! 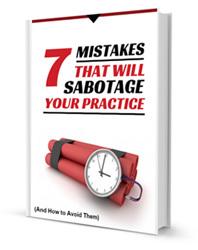 I take you through the 7 most common mistakes I see people struggle with while practicing. Then I show you how to avoid them so your practice can be effective and efficient. Get the book for free. Join the thousands who have learned that Smart Practice is the key to getting better at anything! Success! Now check your email to confirm your address and download your eBook! Just one step away from better practice! © Copyright 2019 Smart Practice Academy. All rights reserved.